Great meeting with @NFIB_WI today. Thanks for coming to DC to discuss how we get the economy moving again! Thanks to Cong Pence, Bucshon, Young, Stutzman and Sen Coats for meeting with IN NFIB members in DC. Keep up the fight for free enterprise! @nfib_wa @DavidGregory Great fireworks between Gregory and small business members.They don't mess around. Thank you @JohnThune and @RepKevinBrady for talking about small business tax issues at the #NFIBSummit! America's most trusted, most accurate, voice on all things political. Publisher of the "Cook Political Report." The go-to authority for clear-eyed analysis of all government developments affecting this country. Editor and Publisher of the "Rothenberg Political Report." Columnist for "Roll Call." White House Deputy Chief of Staff during President George W. Bush's administration. Speaker of the United States House of Representatives. Attorney and partner at Jones Day, represented NFIB in healthcare lawsuit NFIB v. Sebelius before U.S. Supreme Court. Attorney and partner at Jones Day, also served as legal representative of NFIB in constitutional challenge to individual health-insurance mandate. 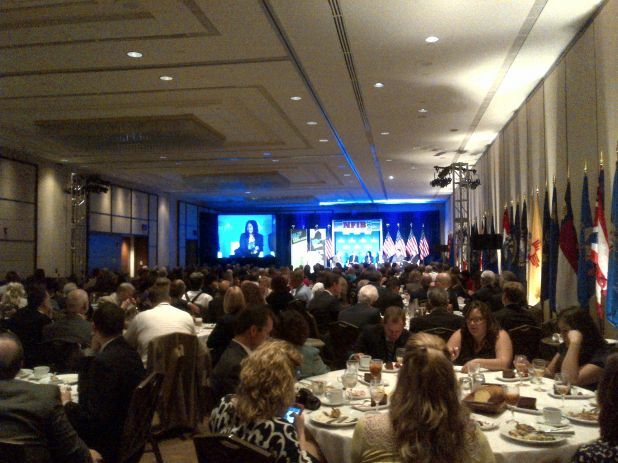 The 2012 NFIB Small Business Summit is the nation’s premier event for America’s small business owners. With the future of the economy and the country up for grabs in next year’s elections, this is an opportunity to engage with political insiders and policy experts and speak up for what you believe in.